Today I took a fresh look at the 3301 Cicada image. In the past I thought it was a composition of multiple cicadas — and it still might be — but I now think it’s primarily a Distantalna splendida formerly Tosena splendida, a cicada found in southern Asia (China, India, Burma, Thailand, Vietnam, etc.). 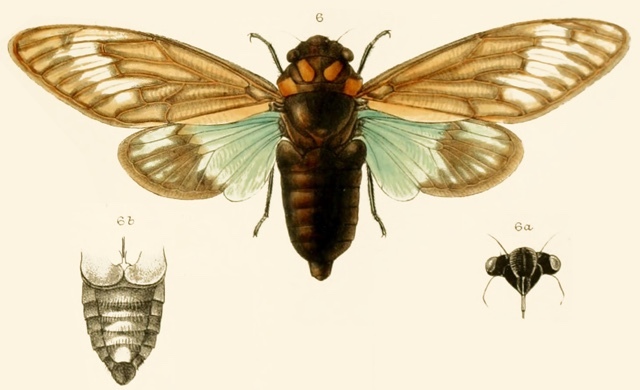 Distortions caused by embossing — or whatever filters they used — makes identifying the cicada difficult. Here’s my comparison of the wings. I will probably do a comparison of the body and head at some point. Specimens vary in appearance (size, wing patterns) from individual to individual — they all look similar, but they’re not exact matches. The process of spreading a specimen’s wings and preserving it can also alter its appearance, and introduce unnatural changes to the insect’s morphology. Distantalna splendida are easy to find on eBay or taxidermy shops if you’re interested, although they’re often mislabeled using their former name Tosena splendida, or something totally different.